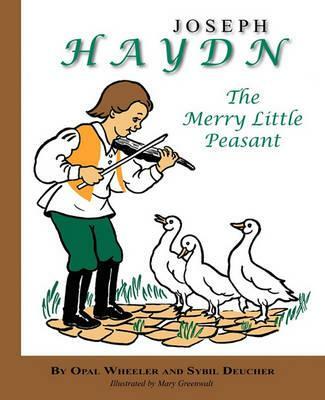 Joseph Haydn, The Merry Little Peasant, is a simple, inspiring children s biography of the great musician Franz Joseph Haydn which will win its way into the hearts of all music-loving children. As a child, Franz Joseph Haydn was called "Little Sepperl." He used to sit on a stool near his father with two smooth pieces of wood held firmly in his hands, playing his own make-believe violin. His parents watched as the boy drew one piece of wood slowly across the other. He played very seriously and kept perfect time! One day he went to live with his cousin in a town near Vienna. He learned to read music and sing. Once when the drummer was too sick to march in a procession, little Franz Joseph was asked to take his place. He practiced all day on a barrel with a cloth tied over the top until he could play the part without a single mistake. Such were the musical beginnings of the boy who would play before kings and who penned some of the most beautiful music ever written. Recommended for boys and girls from 8 to 12 years of age."